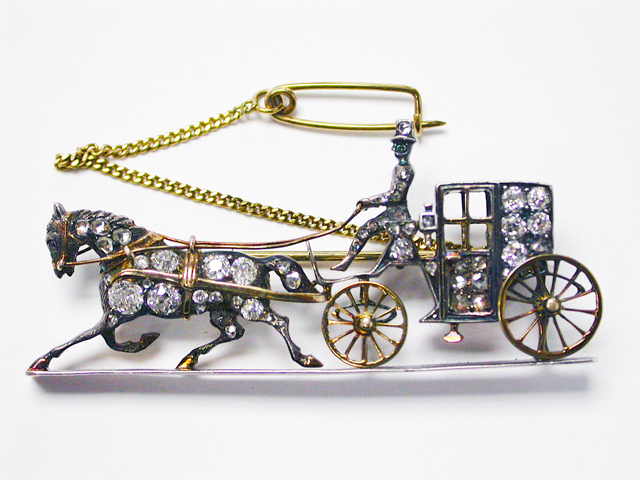 A beautiful 10kt yellow gold and silver top horse carriage brooch with moving wheels and safety pin, featuring 1 round facetted cut medium red ruby, est. 0.01ct; 34 rose cut diamonds, est. 0.18ct (clarity: SI-I1 & H-I-J colour); 5 old European cut diamonds, est. 0.39ct (clarity:VS-SI1 & H-I colour) and 9 old European cut diamonds, est. 0.20ct (clarity:SI & H-I colour).